Even for experienced Facebook advertisers, setting up a Messenger Destination Ad requires a little explanation. The documentation should help, and below is a deck that I send to clients to help with the first setup. I’m sharing here, in hopes that more people are able to launch and test Messenger as a Destination Ads. Advertisers are used to a ad-click that leads to a landing page. 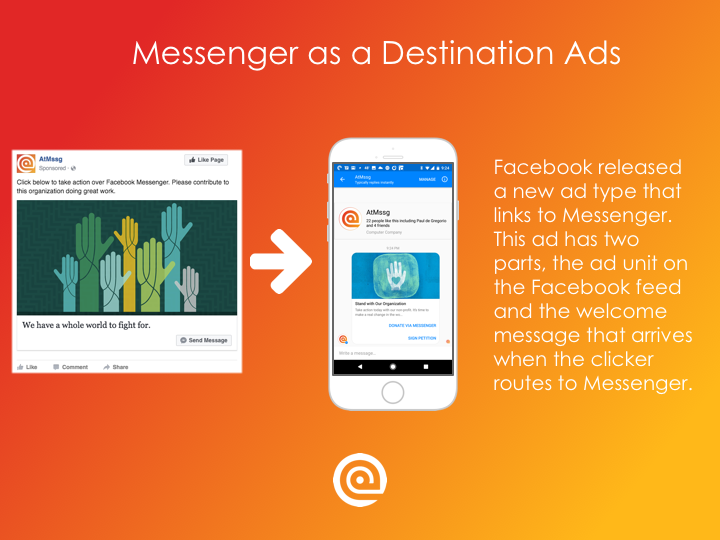 With Messenger Destination Ads, the click takes the clicker in to Messenger, where they instantly receive a Welcome Message. 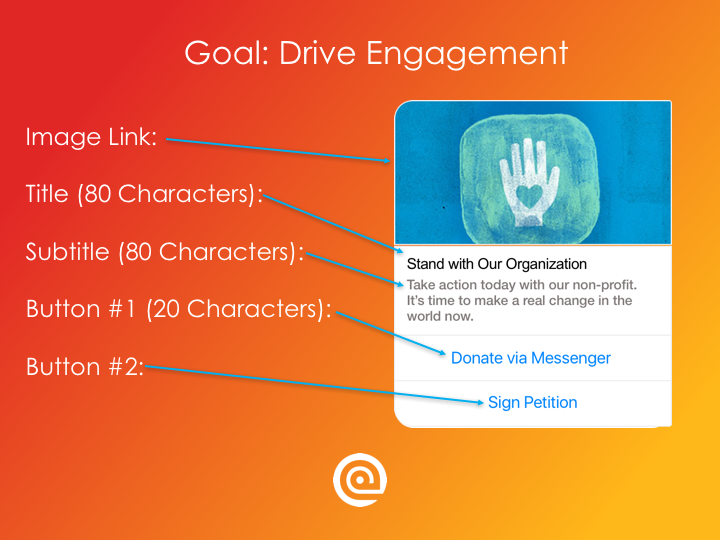 Once the user engages with the Welcome Message, then the automated campaign aspect can start to power the conversation. When explaining the process, it’s important to start with the high-level user flow. So that is the first slide in the deck. 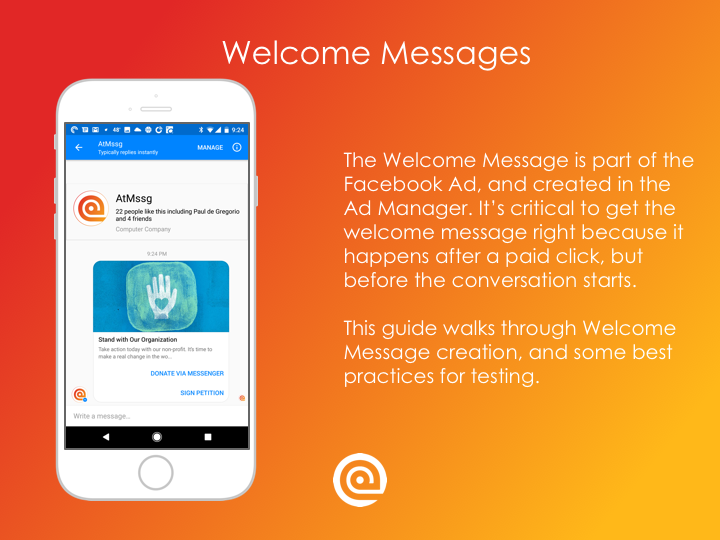 When the advertiser builds a Messenger as a Destination Ad, they build the regular Facebook Ad and they also create a Welcome Message and attach it to the ad. The advertiser will generally understand how the Facebook Ad works so we focus on the Welcome Message, because that’s the new piece. 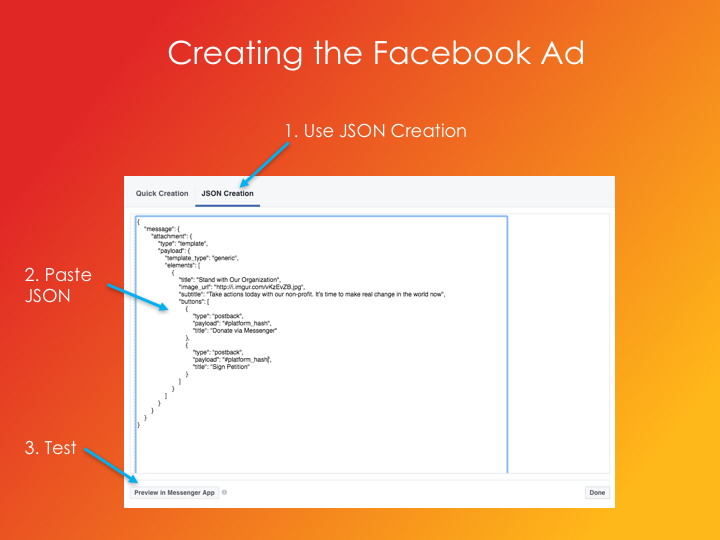 Generally if a client gets confused it will be because they’re conflating the Facebook Ad and the Welcome Message. In discussions we are constantly reinforcing the importance of the Welcome Message. By the time the clicker receives this message, the advertiser has already payed for the click. If the recipient doesn’t engage with the Welcome Message, they are never actually seen by the advertiser. So getting the clicker to engage with the Welcome Message is absolutely the top objective of the campaign. Without this engagement the advertiser gets nothing but cost. There are a few different components in the Welcome Message — Title, Subtitle, Image and Buttons. 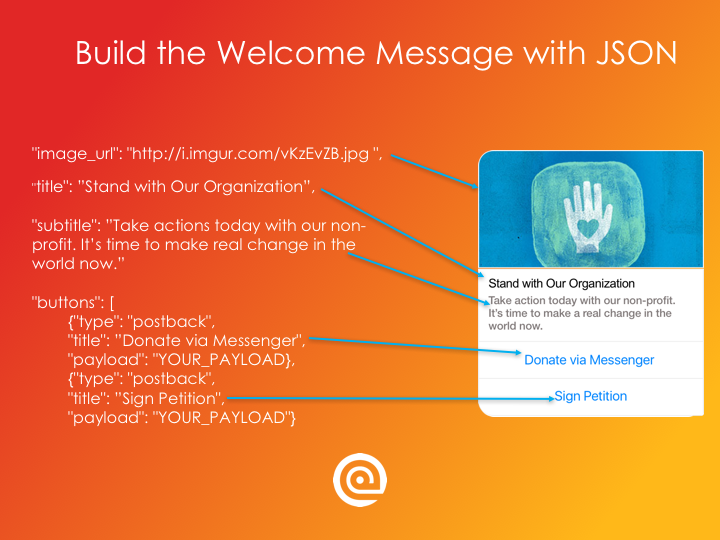 The best way to build the Welcome Message is with a JSON file. It looks a little complicated, but it’s really just specifying values for the image, title, subtitle and buttons. A pro tip is to save this JSON file as a gist (https://gist.github.com). Saving the files and emailing them back and forth can allow for formatting and file errors to creep in and can be frustrating. The payload in the JSON is data that is passed to the Messenger Application (bot) when the user clicks the button. This allows for a system to track ad clicks and respond differently based on how the user engages with the Welcome Message. 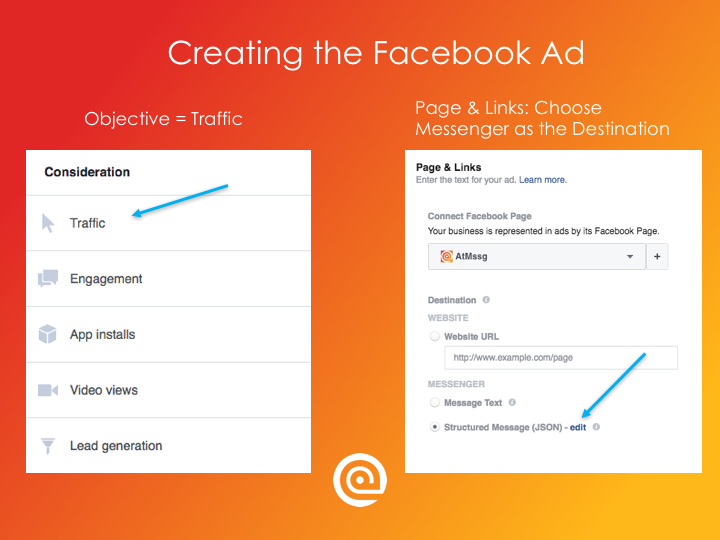 Once the Welcome Message is created, it should be added to a Facebook Ad and tested. The Facebook ad is a regular ad in the Facebook Feed. At the beginning of the creation process, the objective should be “Traffic”, although the new documentation allows for “Conversions”. It’s unclear how Conversion Ads would be tracked within Messenger. Once the Objective is selected, the Advertiser can build their audience/targets and placements out as usual. Facebook will automatically serve the Ad to people that are likely to have Messenger installed and there are certain placements where Messenger Destination Ads will not be shown. Facebook notifies the advertiser throughout the setup process. On the final step of Ad Setup, Messenger and Structured Message can be selected as the Destination. Once this radio dial is clicked, the advertiser can click “edit” next to the JSON and paste in the JSON for the Welcome Message. Once the Welcome Message JSON has been pasted, click Preview in Messenger App and Facebook will send the Welcome Message so it can be reviewed. This is a very important step in the Ad creation, and the Welcome Message buttons should be tested to make sure that the conversation works as expected. When Messenger as a Destination is chosen there are actually two options for the Welcome Message — Message Text and Structured Message (JSON). Choosing Message Text will resend the Facebook Ad in Messenger with a button that says Get Started. Essentially the user will need to click the ad twice to engage. I haven’t seen direct testing comparing results from the Message Text and the Structured Message, but the Structured Message has many more options for testing and engagement. All signs would point to the Structured Message seeing more conversations started. If you look even closer at the last slide with JSON code you’ll see the Quick Creation option as opposed to pasting JSON. The Quick Creation option seems extremely limited and it isn’t even clear what the use cases might be. Pasting the JSON is a strong recommendation. If you’re interested in the full deck or have questions, leave your email below this post and someone will followup.